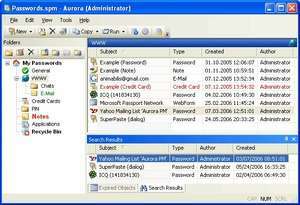 Aurora Password Manager is a typical password management program which allows users to store multiple usernames and passwords behind AES-256 encryption. Included with the ability to protect usernames is the functionality to save other data within the database such as credit card numbers, PIN numbers and any other sensitive data a user would like to protect. The program can save the different data under different categories which the user can create; the categories themselves can also be represented by an image or icon which users can choose. Aurora Password Manager also includes extra features as most other competing software titles in the same category do: the most useful is probably the random password generator and for others, the backup feature. For security reasons, you should also check out the Aurora Password Manager download at LO4D.com which includes virus and malware tests. Additional screenshots of this application download may be available, too.